The University of California is a national leader in educational quality, affordability and alumni success, according to new rankings released today (Aug. 13) by MONEY magazine. On the magazine’s annual list of the 50 Best Colleges in the U.S., UC campuses took five of the top 11 spots, with two additional campuses in the top 40. UC San Diego, UC Irvine and UCLA ranked second, third and fourth on the list respectively, with UC Berkeley at No. 7 and UC Davis No. 11. 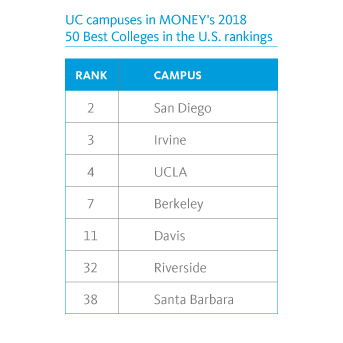 Also included among the nation’s top schools were UC Riverside at No. 32 and UC Santa Barbara at No. 38. The magazine evaluated public and private U.S. colleges and universities based on academic excellence, affordability and post-graduation outcomes. “The fact that a student can come to UC, learn alongside top faculty and high-achieving peers, and graduate with minimal student debt is a game changer for many families,” said Pamela Brown, vice president for Institutional Research and Academic Planning. “In an economy where young people often struggle to get ahead, UC is an upward mobility engine for thousands of students every year." MONEY magazine determined academic quality by assessing graduation rates and student populations served (including transfer and low-income students), among other factors. Alumni outcomes were calculated using graduate salary information, comparing the data to those of other college alumni in addition to high school graduates. Affordability was measured by the estimated total cost of attendance with and without financial aid, the percentage of students who receive financial assistance, and the average student debt and repayment rates. Financial aid fully covers tuition and fees for more than half of UC’s California undergraduates. On average, UC students graduate with approximately $10,000 less in student debt than the national norm, while about 50 percent of UC students graduate with no debt. Today’s announcement comes on the heels of the release of the university’s 2018 Accountability Report, which demonstrates how a UC degree serves as a powerful economic equalizer for undergraduates. According to the report, 77 percent of UC’s low-income students earn more than their parents within five years of graduating. All alumni, regardless of field or discipline, see their earnings double between two and 10 years after graduation.